Though PDF documents are difficult to edit, it is true that up to a certain extent Adobe Acrobat can assist in editing PDF. However the main problem with Acrobat is that most people are not familiar with the ins and outs of the program. Hence, if you are willing to make changes to a PDF document like altering character spacing, the right software is needed. Hence we came up with this article to help modify character spacing in PDF. Once you are done reading the article, it will become easy to modify character spacing in a PDF document. Character spacing is basically needed to enhance the visibility or reading capability of the document and for this purpose PDFelement ProPDFelement Pro is the best choice for modifying character spacing in PDFs. PDFelement Pro is a PDF editing software for MAC and Windows. The software is designed to make PDF editing an easy process. With the help of this easy-to-use PDF editor, you can easily modify character spacing in a PDF or in PDF form field. You can also use this PDF tool to edit texts, images, links and pages in PDF document easily. With advanced OCR feature, you can even edit scanned PDF documents with ease. In this section we will learn about PDFelement Pro and its function to help in modifying character spacing in PDF. Download and install PDFelement Pro, be sure to download the appropriate version for your OS. When you open PDFelement Pro you will get a homepage, like the screenshot below. The next step is to import the PDF file you want to change. 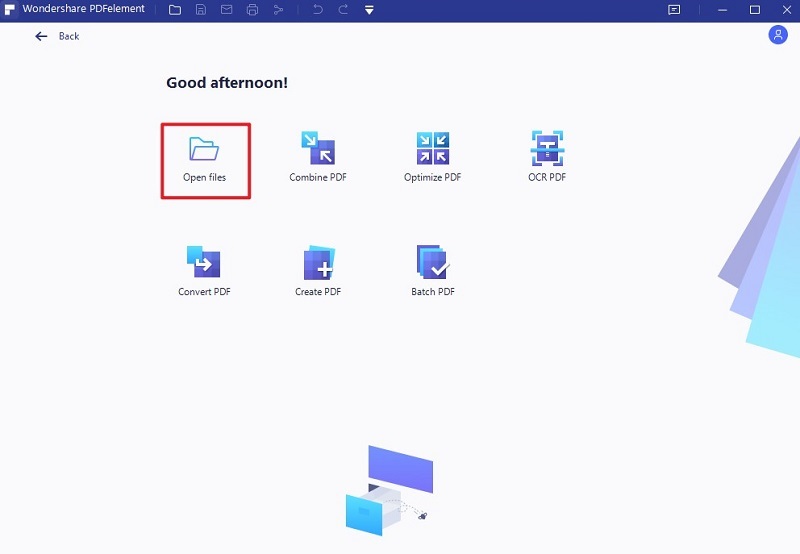 Simply click on the “Open File” dialogue box. Choose the file from your local drive or a folder. After you've import the PDF file into the program, you can open the "Edit" panel. Click on the "Edit" button on the top left corner of the main toolbar. Move the cursor to select the desired text content, then you can find the "Character spacing" icon on the right side toolbar. Click on the icon and you can choose the specific character spacing number value or customize the number according to your own needs. Hereby you can see the following the above process will make it quite easy to modify the character spacing in a PDF document. Note: Users may find that space character missing in PDF when converting or editing PDF. To solve the problem, you can use PDFelement Pro to edit and modify the character spacing in PDF before the conversion. You will not find a better choice for editing PDF documents than PDFelement ProPDFelement Pro. There is no other software package that offers the variety of editing features that PDFelement Pro does. You can make significant alterations to the content of a PDF document in the blink of eye. It is very convenient for office workers who need to make improvements to documents, creating character space before sending it to their superiors. PDFelement Pro is more than just editing software. If you need to convert PDF documents into a different form, it can be done through PDFelement Pro. The conversion process is simple, smooth and can be completed within seconds. PDFelement Pro offers a wide variety of formatting options for users to choose from, the options include: EPUB, HTML, WORD , EXCEL, PPT, RTF, HWP, HWPX, Text. Edit text and images on a page with various PDF editing tools to crop, insert, convert, and edit data in secure way. You can add security in the form of passwords and watermarks. Convert PDF documents to EPUB, HTML, Word, Excel and many more. Perform an OCR scan on the PDF document. You will have full control over PDF document to maintain business details in terms of documentation and accounting.